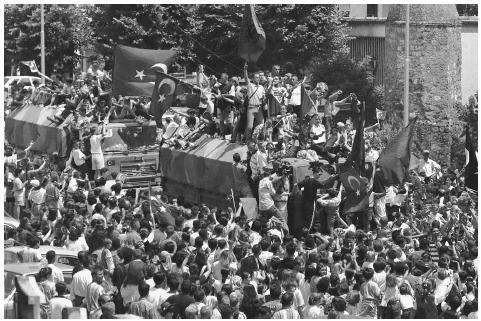 Thousands of ethnic Albanians waving Turkish and Albanian flags welcome Turkish NATO peacekeeping soldiers in Prizren, Yugoslavia, in 1999.
of the alliance is established at the North Pole, past the Northwest Territories of Canada, while the southern terminus is located at the Tropic of Cancer, which runs between Florida and Cuba. The idea for NATO germinated as the Cold War descended. Some democratic nations of Europe feared that they had been so weakened by World War II that they did not have the strength to fend off an attack by an increasingly aggressive Soviet Union without American assistance. Policymakers hoped that future war could be avoided by declaring that an armed attack upon one NATO member constituted an attack upon all members and that the threat of U.S. involvement would act as a particularly powerful deterrent to the Soviets. The treaty establishing NATO was signed in Washington, D.C. on April 4, 1949, and then subsequently ratified by its member countries. The NATO signatories agreed that if such an armed attack occurred, each NATO member would assist the victimized state by taking individually and in concert with each other such actions deemed necessary, including the use of armed force, to restore and maintain international peace and security. The vagueness of the treaty meant that the exact mechanism of the alliance would develop over time. In the initial decade of its existence, NATO planned to deploy nuclear weapons in retaliation for a Soviet military attack. Under influence from U.S. President John F. Kennedy, the doctrine of flexible response replaced massive retaliation and no longer would automatic use of nuclear weapons be NATO policy. Although the United States has been the dominant member in the past, NATO is governed by a North Atlantic Council that consists of permanent representatives of all member countries, who meet weekly. The council explains NATO decisions to the general public and to non-member nations. It also bears responsibility for creating subsidiary bodies to foster the political work of NATO. The Supreme Allied Commander of the Supreme Headquarters Allied Powers Europe (SHAPE) handles the military responsibilities of NATO. This command is divided into three parts: Allied Forces North Europe (AFNORTH), Allied Forces South Europe (AFSOUTH), and Other Commands. AFNORTH protects Belgium, Czech Republic, Denmark, Germany, Great Britain, Luxembourg, Netherlands, Norway, Poland, North Sea, Irish Sea, English Channel, and the Baltic Sea. It consists of Allied Air Forces North based in Ramstein, Germany, and Allied Naval Forces North based in Northwood, United Kingdom. AFSOUTH covers Greece, Hungary, Italy, Spain, Turkey, Black Sea, Sea of Azov, the whole of the Mediterranean and the Atlantic approaches to the Strait of Gibraltar east of longitude 7° 23' 48" W, and an area around the Canary Islands and its associated airspace. Headquartered in Naples, Italy, the force is made up of Allied Air Forces South and Allied Naval Forces South. Other Commands included the Maritime Immediate Reaction Forces, which offers continuous naval protection, and the NATO Airborne Early Warning Force, which provides air surveillance. The collapse of the Soviet Union has challenged NATO by removing its main reason for existence. The organization is struggling to find a new role and has begun to focus on the fight against terrorism. The NATO-Russia Council, established in 2002, is identifying opportunities for joint action in all areas of mutual interest but especially in the use of the military to combat terrorist attacks. The future will probably see increasing cooperation between these former enemies as NATO alters in response to changing transatlantic security needs. Cook, Don. Forging the Alliance: The Birth of the NATO Treaty and the Dramatic Transformation of U.S. Foreign Policy Between 1945 and 1950. New York: Arbor House/William Morrow, 1989. Kay, Sean. NATO and the Future of European Security. Lanham, Maryland: Rowman and Littlefield, 1998. Park, William. Defending the West: A History of NATO. Brighton: Wheatsheaf, 1986. Schmidt, Gustav, ed. A History of NATO: The First Fifty Years. New York: Palgrave, 2001. NATO. "North Atlantic Treaty Organisation." January 31, 2003. < http://www.nato.int/ > (February 1, 2003). NATO. "Supreme Headquarters Allied Powers Europe." January 31, 2003. < http://www.nato.int/shape/index.htm. > (February 1, 2003).